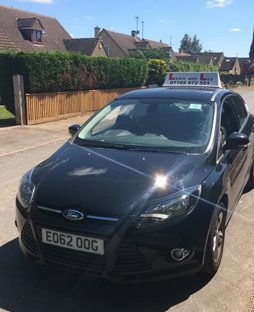 All of your driving lessons will be in a five-door Ford Focus 1.6 diesel. It has dual-controls, air-conditioning, power-assisted steering and a manual six-speed gearbox. Lessons are charged at £25 per hour. A block of 10 hour lessons is available at a reduced rate of £240. *Special offer* – book your first 5 hours of lessons for only £120. Refresher and motorway lessons are also available, please contact me for further details. By booking a lesson with Learn with Lea, you agree to abide by the terms and conditions.